Tired of Cluster flies being lured into your customers’ homes? Solutions suggested from Dr.Stuart Mitchell at PestWest. Adults are 7-9 mm. Distinct thoracic stripes. Gray patterned abdomen. Larvae parasitize earthworms. Three generations per year. Slow-moving. A pollinator. Over-winter and refuge (en masse) within structural spaces. The PestWest Cluster Fly Lure is a powerful synomone to attract both female and male cluster flies. It’s sold separately and also an excellent add-on with PestWest Window Wonder Trap or PestWest flying insect management system to trap them. And finally, excluding flies by sealing exterior openings, and applications of a properly labeled insecticide (chemical fence). Place Window Wonder traps with Cluster Fly Lure year-round, but in greater numbers during the early fall, and late winter. Place Window Wonder traps at bases of windows (especially on western and southern exposures). Cluster flies are very annoying, but do not contaminate human food. As temperatures drop, flies invade structures to over-winter. On sunny days, flies are observed on western and southern windows, and within structural spaces. During brief activity, flies exhaust their energy and then spin on surfaces. Place Window Wonder traps containing Cluster Fly Lures as to not come in contact with children and pets. Replace glue boards when filled with flies and/or other insects or when overly dusty. Store Cluster Fly Lure in a dry, well-ventilated, and cool space. Do not smoke or eat prior to handling Cluster Fly Lure. Wash hands before and after handling Cluster Fly Lure. * Prior to any attic or spatial deployments of Mantis and Titan systems, check and comply with all electrical and fire codes. Deploy Mantis and Titan systems per PestWest Instructions for Use. Ask your favorite distributor or call 866 476 7378 for more details. To download “PestWest Cluster Fly Leaflet” in print ready format, please click HERE or on the image below. With the onset of winter’s cold temperatures, don’t be left out in the cold because UVA lamps won’t start! 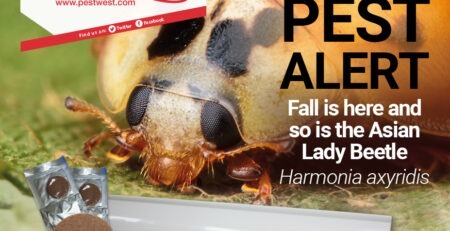 Bugged by Asian Lady beetles? We’ve got a wonderful solution! 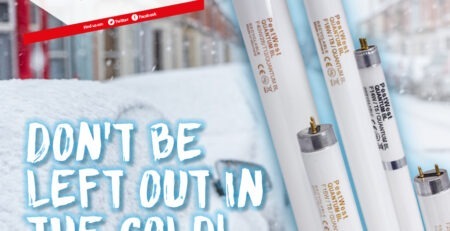 Neither you nor fluorescent lamps should be left out in the cold!